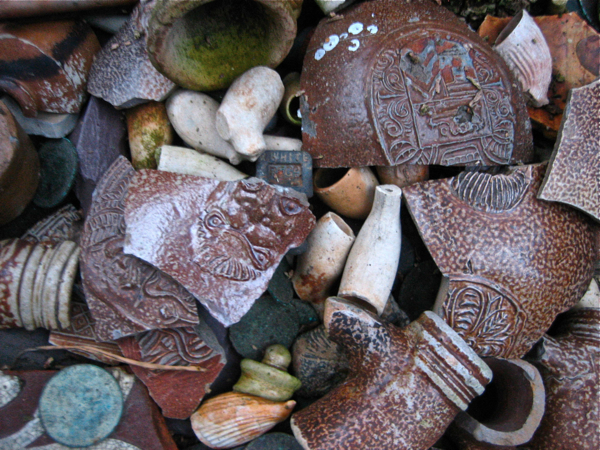 It is my pleasure to begin the new year by inaugurating a new series on Spitalfields Life, in which each month I visit my esteemed friend Steve Brooker, the mudlark – widely known as Mud God – and he shows me prized discoveries from his personal collection, accumulated over seventeen years of scouring the bed of the Thames. 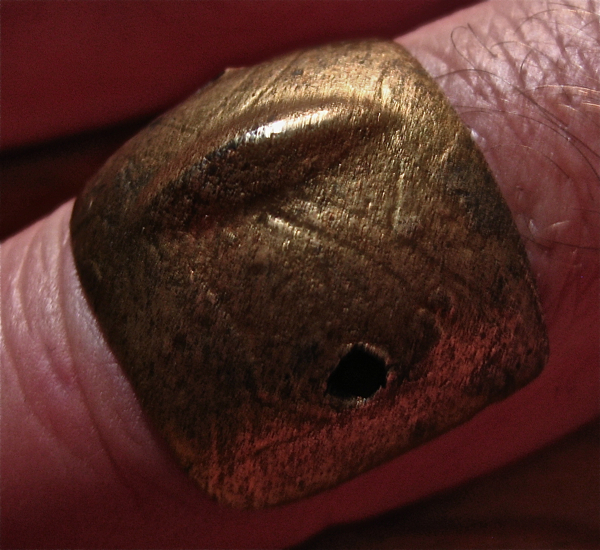 Steve found this knuckle guard from a medieval gauntlet ten years ago at the Customs House near the Tower of London. “I’ve had some amazing finds but, out of all my discoveries, this is the one thing I love the most, a gauntlet knuckle guard from a suit of armour. It’s so delicate, yet by nature of the kink it’s so strong – I can’t bend this,” he told me with a excited grin, his eyes glistening in wonder and delight at the skill displayed in fashioning this gracefully curved sliver of brass and copper alloy inscribed with diagonal lines, once attached by rivets to a chain mail glove. The armoured glove was worn by knight with a cloth or leather glove underneath, yet this knuckle guard just sits upon of Steve’s finger, suggesting that it was made for a much smaller hand, as you would expect in medieval London. “I dug this one out, which I don’t do much anymore,” explained Steve, recounting the memorable discovery as he picked the knuckle guard from his cabinet of treasures, “I dug a hole really deep down into the river bed, and then I put everything onto a board and ran a metal detector over it.” The knuckle guard was lying in anaerobic mud, with no oxygen, which means it was preserved without rust and gleamed with an enticing mystery when he found it, exactly as it does now. Declaring its precise yet obsolete purpose and elegant manufacture, it evokes an entire world gone more than five hundred years ago. “The whole thing is a work of art,” Steve declared to me, cradling it lovingly in his hands to show me, “A rapier was an man’s education, when accomplishment with a sword was everything. Everyone that could afford it had one.” And he pointed out the face at the centre of the elaborate design of flourishes upon the guard that had been bent backwards over the hilt, showing me the silver wire that once contained the binding upon the hand grip. The entire hilt sat within Steve’s hand, revealing, like the knuckle guard, that it was made for the much smaller hand of a Londoner over four centuries ago. “It was thrown away because it was bust,” he theorised with a frown, indicating the useless broken stump of the blade protruding from the hilt, yet balancing the metalwork in his hand appreciatively. 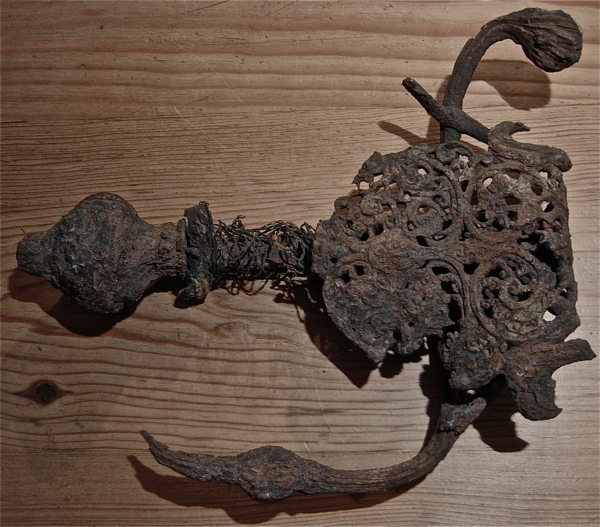 “It’s so ornate, but it feels there’s more power to it when it’s rusty,” he continued, perplexed and mulling over this intriguing survivor from Shakespeare’s London which still carries the dynamic spirit of its age today, even in its damaged state. 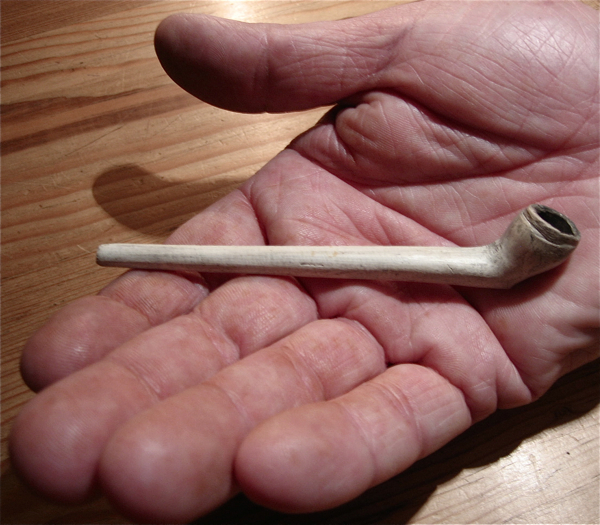 Even before tobacco was introduced by Walter Raleigh in 1586, sailors brought it back and smoked it – but it was very expensive, which is why this early clay pipe dating from 1600 is so tiny. Out of an estimated ten thousand pipes that he has found, mostly from later periods when they were disposable and two-a-penny pre-filled with tobacco, Steve has only found three of these early ones intact. “I don’t know why I like it so much. 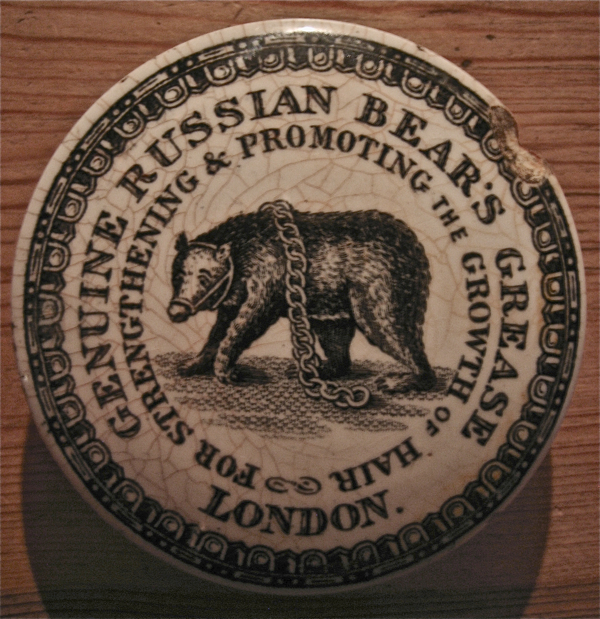 I love the bear and, being bald, – it’s for hair growth – it makes me laugh!” This was Steve’s explanation when I asked him why this nineteenth century lid from a pot of Russian bear’s grease means so much to him. You can admire the elegant typography and the poignant engraving of the creature, while recognising the sad irony of killing bears for a remedy that does not work, but the appeal of this lid remains intangible to Steve. “If I had to choose between this and something of monetary value in the collection, I would choose this,” he confirmed to me resolutely, “I’ve had thousands of things up from the river, but I always wanted to find one of these, and a cannon.” It seems that the nature of mudlarking is such that you can almost never discover what you are looking for in the Thames. “You can’t choose what to find, there’s this guy who finds all these gold coins when he only wants a crotal bell,” Steve confided to me, shaking his head with a playful smirk, as an example of the capricious nature of the river. But one day Steve got lucky when Old Father Thames directed him to a bear’s grease pot lid. 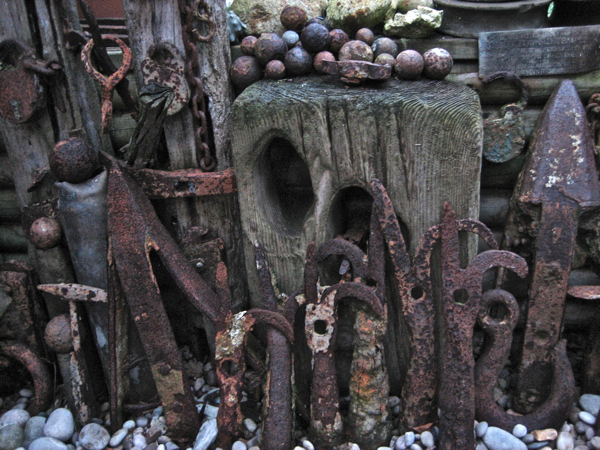 “I’d been to test some mud at Charlton near to the O2 Arena but it was poor for finds, although when I walked back along the foreshore there were a lot of bottles, and that’s where I found what I had sought for years, sitting on a tip.” he told me, widening his eyes in excitement as he recalled the sentimental moment fondly. Now Steve just has the find the cannon, because – as you can see below – he already has the cannon balls to go with it. 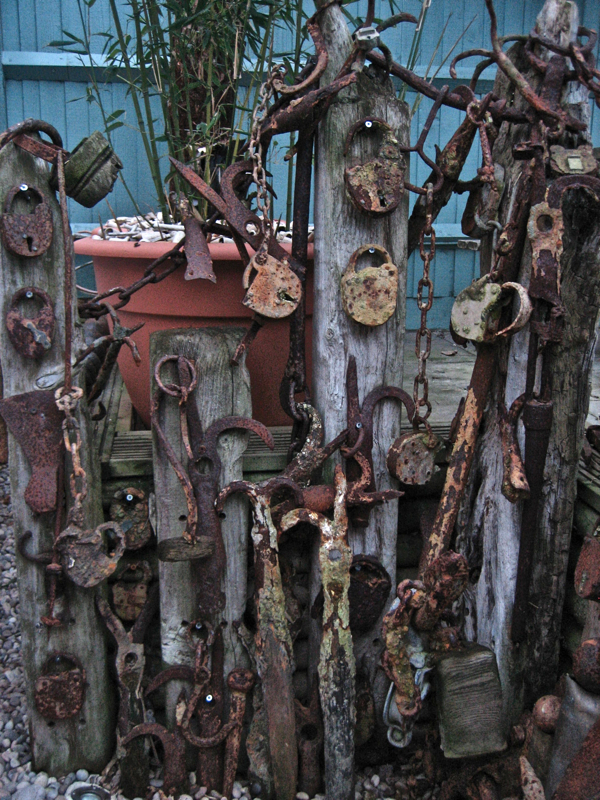 Steve’s finds have spilled out of his house into the garden – boathooks, padlocks, cannon balls, broken Bellarmine jugs and old pipes. You can find out more at Steve Brooker’s website www.thamesandfield.com and there will be further Mud God’s Discoveries here in February. Fascinating. I remember walking along the Thames wondering how much archaeology occurs there, but the amount of material is extraordinary. Absolutely amazing gifts from Father Thames, especially the Bears Grease! great blog too, love it! Terrific stuff, what a character! I know it’s not the main thing, but could you have a quiet word with him about the apostrophe abuse on his website? Eg: THE BALL AND CHAIN HIT’S EVERY NEW’S PAPER IN UK AND GOES “ALL OVER THE WORLD” VIA THEIR PAPER’S TOO…. You’re going to profile new mudlarking finds from the Mud God each month? WOO HOO — can’t wait! 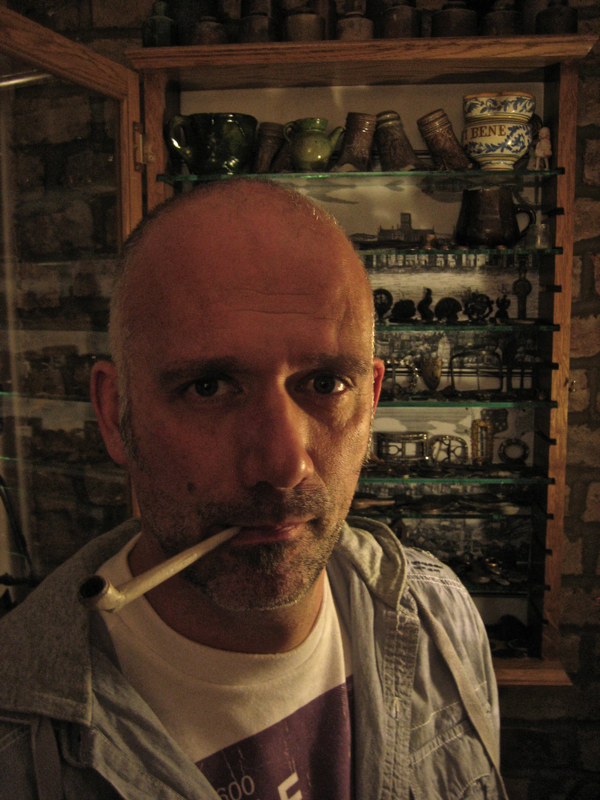 Rather a handsome and brooding character in that pic – it’s not just the pipe! especiall the stevedore,s clay pipe.